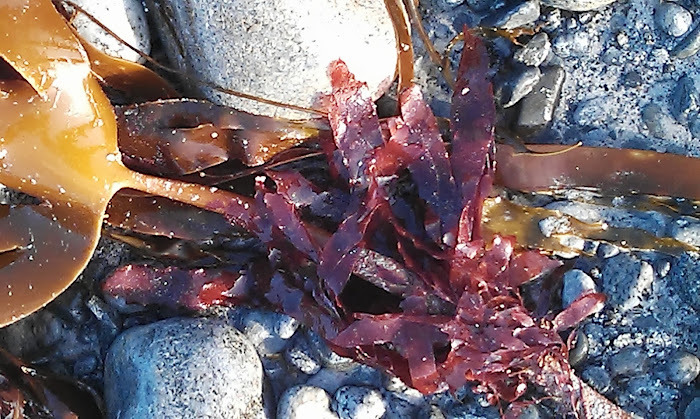 Those harvesting wild seaweed commercially do so, I hope, with similar care and concern; but they do it in larger quantities and also for financial gain rather than for their own table. These seaweed-picking squads are paid by the wet kilo and gather at spring (big) tides (after a new or full moon). We all need to be careful whether picking or harvesting because seaweed is a wild resource and one which we still know too little about. No sooner is a seaweed text book in print than it is out of date. Indeed, my 2015 book “Seaweed in the Kitchen” is undergoing a revamp over the next few months. Seaweed knowledge changes almost daily. There has been a shift towards veganism (360% in the last decade) and a genuine worry about too much dependence on ruminants and their methane production. Living on South Uist I simply can’t buy into this latest food fad. Succinctly, fruit trees simply won’t grow on the hills where the surefooted sheep stamp out pathways through the bracken and heather. The fact that the consumption of lamb has fallen will make little impression on our crofters. It is the most productive way of farming northern hillsides. Any Outer Hebridean tree that survives is often wind ‘styled’ and indeed restricted to the sheltered eastern side. Rowan berries for making jelly may be tricky to find out here but down at the coast where the water is startlingly clear there is a profusion of seaweeds and they complement lamb. My preference is to use dulse which some say tastes of bacon. Seaweed suits those on a vegetarian or vegan diet but we need to embrace fresh seaweed and think sea-vegetable not just expensive seasoning sprinklers which is what happens to most of the wild seaweed ‘harvested’ in the UK. My BBC Masterchef 2001 final recipe used wild venison with wild ingredients - ones that the magnificent red deer might have grazed upon. Ingredients which grow in close proximity or that animals graze, often work well together in a recipe. I started cooking with seaweed when my husband became the Island doctor on South Uist, an outer Hebridean Isle with few trees or bushes; but what it lacks in hedgerows, the Uists makes up for in magnificent beaches. At low tide an ocean garden is revealed where I can gather any amount of seaweed. Red, brown or green each seaweed has its unique flavour and there are hundreds of species to choose from. My seaweed knowledge grows by the day. Unlike with mushrooms toxicity isn’t a problem - but some taste yummier than others.